This swivel arm LCD screen is [Ben Heck’s] latest hack. It replaces the hinges that normally only allow one point of rotation on the screen. You can still use the laptop like normal, but when space is at a premium a second adjustment, both in rotation and linear position, has been added using the slots and screw knobs seen above. Ostensibly this is to use on an airplane, where there may not be enough space to fully open your laptop. We’ll let you decide if it’s wise to try to get your own hacks past airport security. Historically, the TSA hasn’t been impressed with hardware hackers. We like how this came out and could see ourselves using these techniques to make a convertible tablet notebook by reworking the cable routing. We’ve embedded [Ben’s] quick demo of the finished product after the break. If you want to see the whole build process it is the subject of Episode 5 of the Ben Heck Show. Is this video another one of those where he starts one project, then in the middle switches to a different project for most of the video, before finally finishing the first project? If so, PASS. Is he majorly FAT to not have the room on an airplane to open his laptop? Cripes I even had plenty of room to use my 17″ on one of the Delta puddle jumpers. unless his gut sticks out and his fat flows everywhere there is plenty of room for a laptop to be fully open. I have met Ben Heckendorn in person, and he’s actually as skinny as a rail. However, if you’re into actually being able to type on your laptop you should know that having the keyboard pressed up against your stomach is hardly helpful. 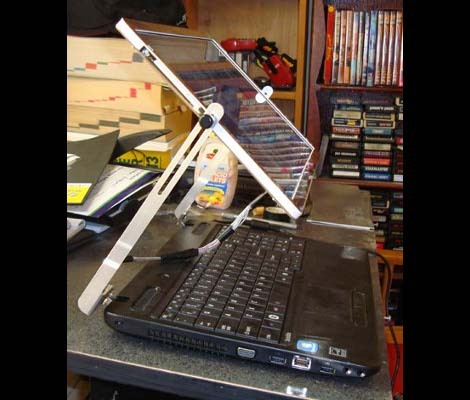 This is so that you can have the base of the laptop a bit farther away and put the screen into a better position. Personally I think it’s a clever design. Also, being able to flip the screen around like that would make an ideal way of making a flip-tablet laptop thingy. I hate, no I HATE it, when I’m using my 17″ or even my 12.1″ Tablet on an airplane and the incredibly inconsiderate yahoo in the seat in front of me abruptly reclines his seat while I’m using my tray table not only to support my laptop but ALSO my shallow cup of Coke the flight attendant just poured for me. This could also make a sweet all-in-one mode for watching movis on a desk, using a touchscreen, etc. Actually there was an IBM Thinkpad that used to do this. It was a proto-tablet model in the 7XX range (I think). Vadem/Clio did this way before Ben and IBM did- Produced and sold en-masse in 1998. This is like that new Dell (Toshiba? Something, whatever) laptop/tablet that’s out that has a swiveling screen. There’s an actual, commercial, purchasable-now product out there with a swivel screen. But not extensible, which gives me the idea that every laptop from now should have in-built the ability to extend the screen upward once the lid’s open, to improve ergonomics. Wouldn’t be too hard or add much expense. Very clunky and fragile looking. @mbear: It was/is the IBM Transnote (P3 with 600 MHz). It has a 10 inch touch display and its base is a bit larger than A4 and letter. I agree with Wolfton and arfink that this design can make it much easier to get a good viewing position in-flight (among other places). My PB G4’s video flex cable shows signs of being close to giving up the ghost, so it’s nice to have an alternative approach when it comes time to fix it. Is he fat? No. He’s tall. I have the same problem on planes. More so when the person in front of you pushes their seat back. I’d love this on a laptop. It looks a little fragile But other than that it’s pretty solid in my opinion. OT, looking in the background of the photo… exactly how many old game carts has he got stacked underneath his DVDs? Every laptop should have this, with just a little twisting you could make it into a tablet too. WHYYY?? :'( every time i have a good idea either someone else comes up with it after me but publishes it before me or i realise its from a vague maemory when i eventually re-discover it. i though of this two years back. haven’t got round to making it yet and im only 13 so its not like i could get a patent or do anything amazing that costs money. anyone else have this happen to them or is it just me? I’m tall enough that I refuse to even try to use my laptop inflight. Not worth the hassle. What I’d like to see is a dual-head transformer-like laptop with two monitors that and have some reasonable positionability. time to exhibit scissorphobia. since scissors probably weren’t invented in time to make a latin word, Xyrophobia is the fear of razors.. anyway: flexible steel cable shielding. a little preemptive googling would have helped here.. nice thingamajig, i wish my phone did that. its cool, i like the design. I admire his soldering skills. As the hardware hacker in question mentioned with respect to airport security, it is NOT the TSA who had any issue with my breadboard sweatshirt. * Massachusetts State Police, who did, != TSA.